-a building will be as strong, as deep, and as high as it's foundation. We therefore pay close attention to core values and beliefs, to assure that what we build of our lives and of our community will be of substantial worth to others, glorifying to God and honouring to our Lord Jesus Christ. 3. You must be BORN AGAIN. 4. Believers can be SPIRIT-FILLED and SPIRIT-LED. ...in the baptism of the Holy Spirit as promised by Christ to the Church, with subsequent empowerment for life and service in the ministry of Christ. This baptism is evidenced in the Holy Spirit’s expression in a supernatural language of worship and prayer, and in spiritual power to maintain a victorious Christian life and witness. ...in the present day expression of the gifts, fruit and presence of the Holy Spirit as mentioned in I Cor. 14:12-14 and as manifested in the early Church. ...in the Church as the Body of Christ, every true believer being an integral part (Ephesians 1:22, 2:19-22), regardless of denominational affiliation. ...in the sacred covenant of Christian marriage, as designed by God since creation and the first man and woman. This marriage covenant is meant to between one man and one woman for life, as we find in both the Old and New Testament scriptures. Such marriage relationships are a visible reflection of the invisible union that exists between Christ and the Church. ...in the second coming of Jesus Christ as the Blessed Hope of the Believer. (Acts 24:15; Acts 1:11), and in the final judgment of all men; those who reject Christ’s provision of redemption and salvation will experience eternal separation and judgment from God’s presence, those who trust in Christ will enter into eternal life in the joy of God’s presence and His eternal purposes forever. •We value the Presence of God, in our worship and in our personal lives. We will always give substantial amounts of time in our gatherings for heart connecting worship, prayer and praise. Our times of worship are not 'sing-a-longs' or preliminaries to preaching, they are what we have been born again to do. • We value Biblical teaching and preaching that brings us into the truth that sets men free, and that gives words of Spirit and Life, that feeds the hungry soul. • We value authentic relationship, which brings us face to face with ourselves, with others and with the God who made us, formed us, is transforming us, and who has brought us into community. • We value the uniqueness of individuals, we celebrate the covenant of marriage and the sanctity of family life, yet recognize that many live as singles, either for life or through processes of life, and their worth is intrinsic as individual members and contributors to the body of Christ. How's your foundation -have you taken the time to establish yourself rightly on a robust and strong footing? The Purple book will help you to dig down and lay it on the Rock! Spending only 20 minutes a day through the 54 lessons of the Purple book, and taking around 3 months to complete -you will be well on your way to a victorious 2019. The Purple book is available at New Destiny Church. 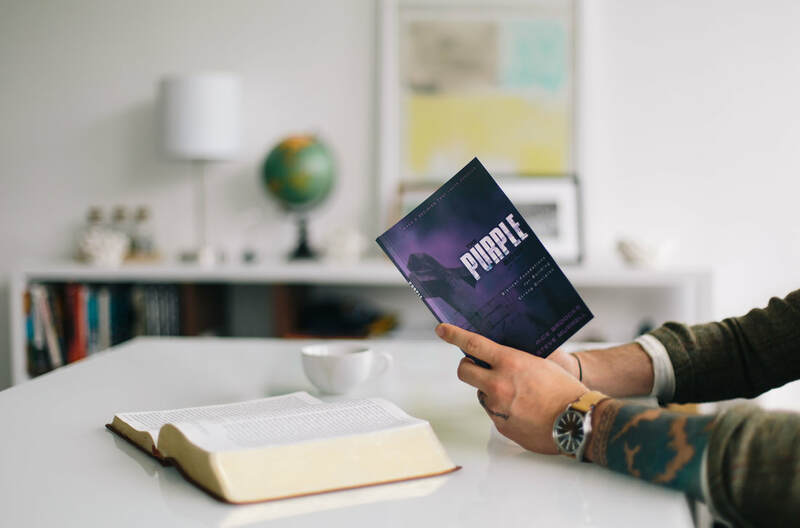 We recommend doing the purple book with a mature spiritual mentor to help you establish the foundations of your spiritual life and walk with the Lord. Doing the daily readings and exercises, and meeting weekly with a spiritual mentor is an effective way to maximize your growth while doing the Purple Book!